Clean energy • Event precedes DeChristopher's trial. Francisco Kjolseth | The Salt Lake Tribune Representing billionaires for coal, Derek Snarr, left, Hillary Hase, Alexis Baigue and Ryan Peune stage a mock countervoice to the coalition of local air quality, climate and labor groups holding a protest in front of Ambre Energy in downtown Salt Lake City on Wednesday. 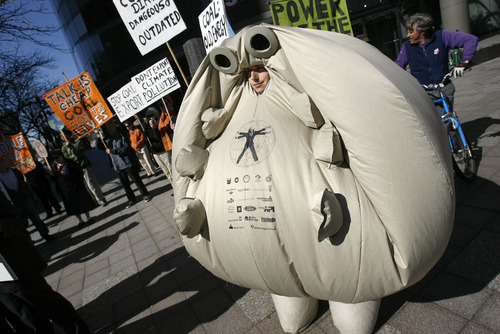 Francisco Kjolseth | The Salt Lake Tribune Jake Hanson wears the Survival Ball, a mock creation by the Yes Men, as the coalition of local air quality, climate and labor groups holds a protest in front of the Ambre Energy North American headquarters in downtown Salt Lake City on Wednesday. Francisco Kjolseth | The Salt Lake Tribune Climate activist Tim DeChristopher, right, attends a protest over coal exports Wednesday in front of the Ambre Energy headquarters in downtown Salt Lake City on Wednesday. DeChristopher's Peaceful Uprising group, along with the Rainforest Action Network, sponsored the rally. Clean-energy backers rallied outside the Salt Lake City office of an Australian company seeking permits to build a coal-exporting terminal in Longview, Wash. 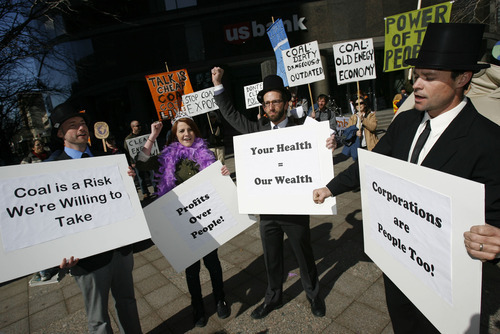 The rally against coal, outside of Ambre Energy's North American Headquarters in the U.S. Bank building on Main Street, attracted about 40 protesters holding signs and chanting about coal's environmental and health effects. Some were nonresident activists visiting Utah for the scheduled Monday start of climate activist Tim DeChristopher's trial for disrupting a federal oil and gas lease sale. DeChristopher's Peaceful Uprising group, along with the Rainforest Action Network, sponsored the rally. DeChristopher attended and held a sign reading "Clean Energy Now." 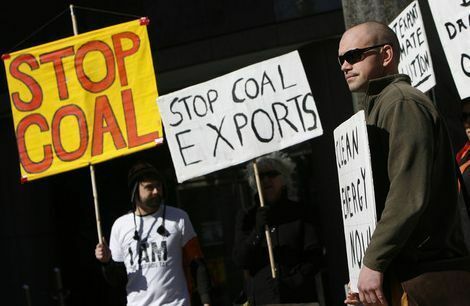 Scott Parkin, a San Francisco-based coordinator for the Rainforest Action Network, said the United States should not ship coal to China and other nations with lesser health and emissions standards. "They're going to be exporting a lot of the health issues," he said at the lunchtime rally, "as well as greenhouse gases." An Ambre Energy subsidiary is seeking to build the port. The Salt Lake City office was inaccessible to the public Wednesday afternoon, and company officials did not return a phone call seeking comment.